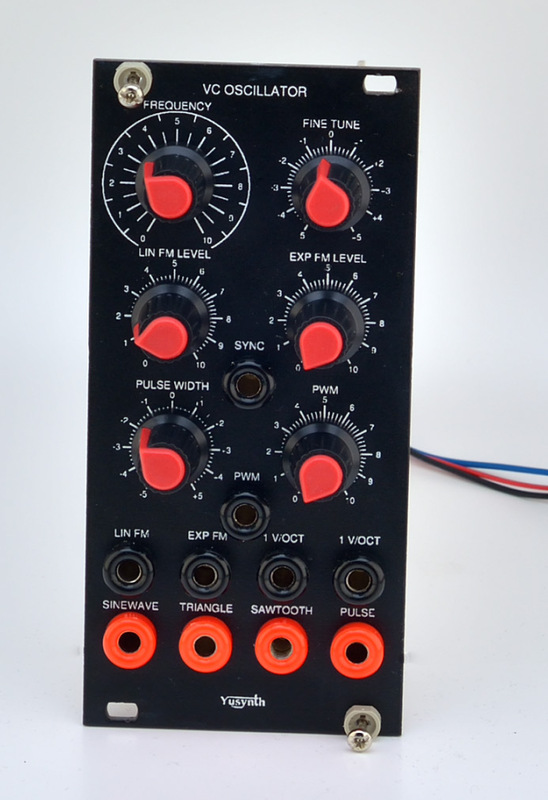 Should modular DIYing compare to a meal, the VCO is the main course ! 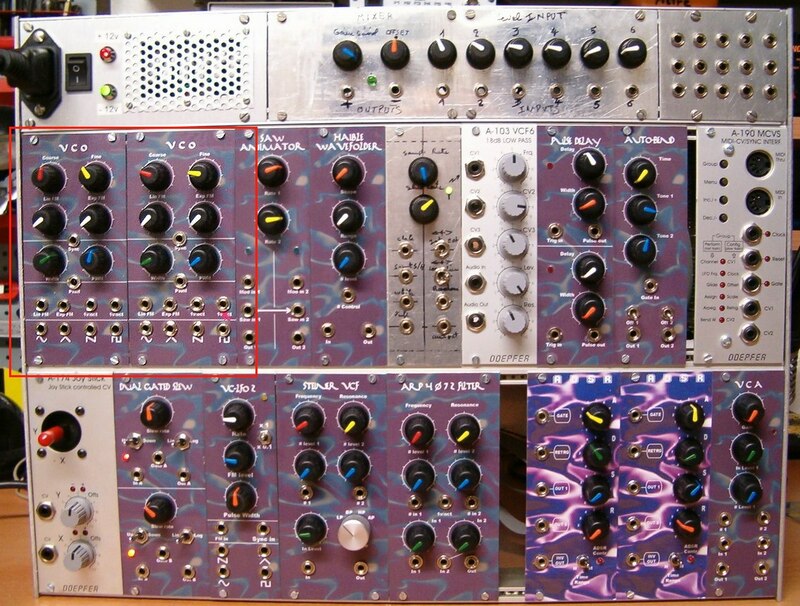 It is the heart of the system, the module without which a system cannot be called a Music Synthesizer. The design of such a module is not easy and building one with good accuracy, low drift and good thermal stability is not simple. I have tried various architectures and eventually came up with quite a classical design. 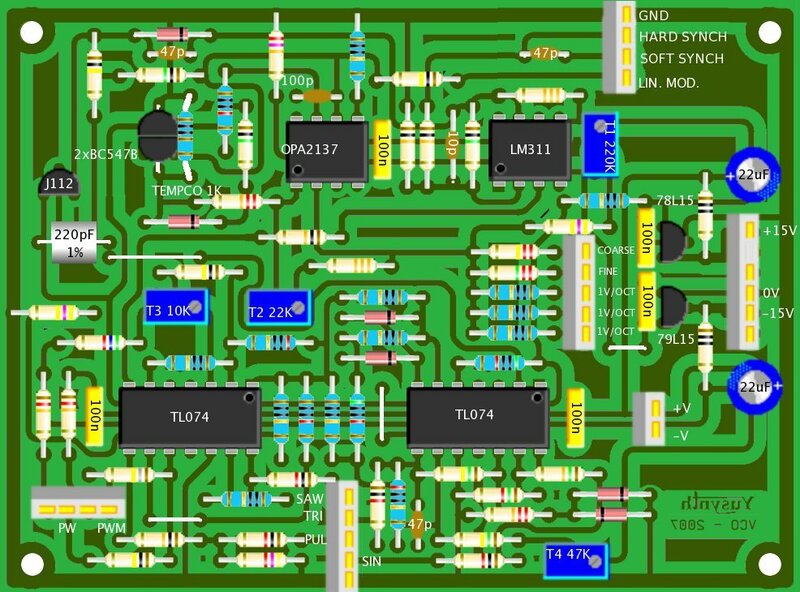 Herein I propose, three different PCB designs that let the builder choose the solution that matches best his/her needs or budget. 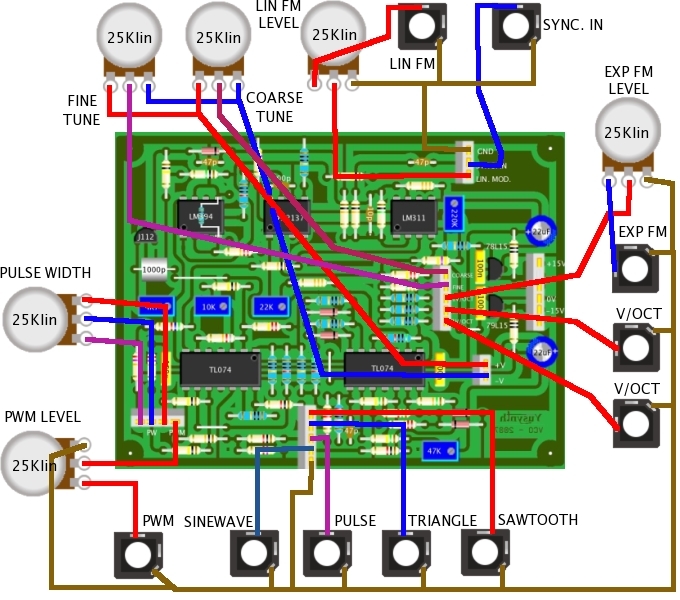 The first design uses high grade components such as LM394 or SSM2210 chips for the dual transistor of the exponential converter and an OPA2137 low bias OPA for the voltage summer and servo OPA. 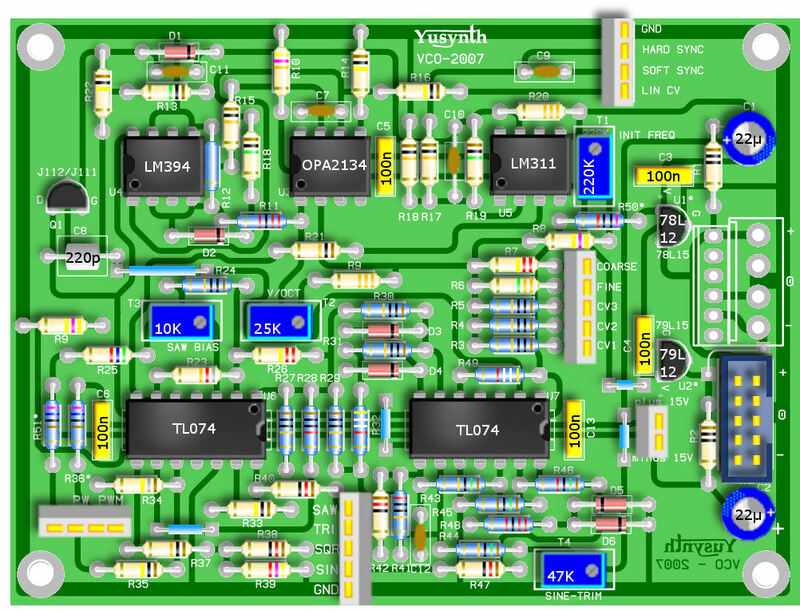 The second design uses a Japanese 2SC1583 dual transistor which is much cheaper. The third design uses a pair of hand matched BC547B. 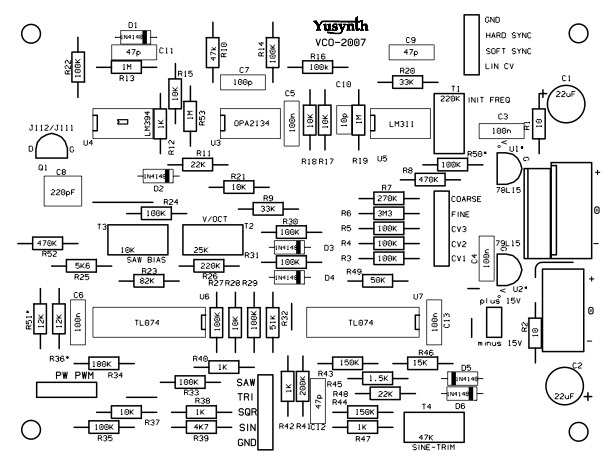 This VCO provides also an input for SYNCing, on the PCB I provided two different inputs, one for SOFT SYNCH mode where the slave VCO is allowed to lock on the any harmonics of the master VCO, and the HARD SYNCH mode where the slave VCO is forced to lock on the fondamental of the master VCO. I have received a lot of emails concerning the voltage regulators used in the circuit. Here is an explaination for the reason why they are there. Are these two regulators useful here considering I am already using a regulated +/-15V ? Considering that the 78L15 and 79L15 require an overhead of 3V to give the right voltage why are these for in this circuit ? Could not one just suppress them ? 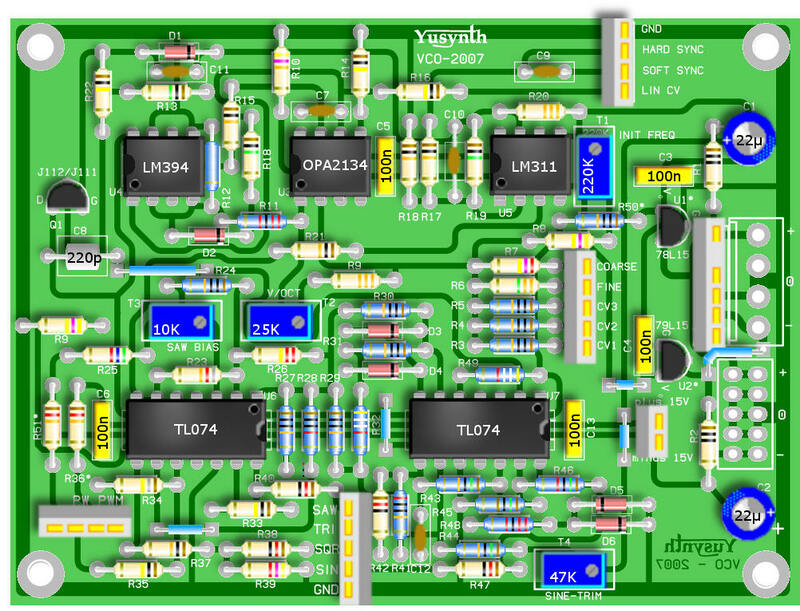 The aim of using these regulators is not to provide +15V and -15V as one would think first. As a matter of fact, because of the lack of voltage overhead and the low current draw they will rather deliver something like 14.2V and -14.2V. 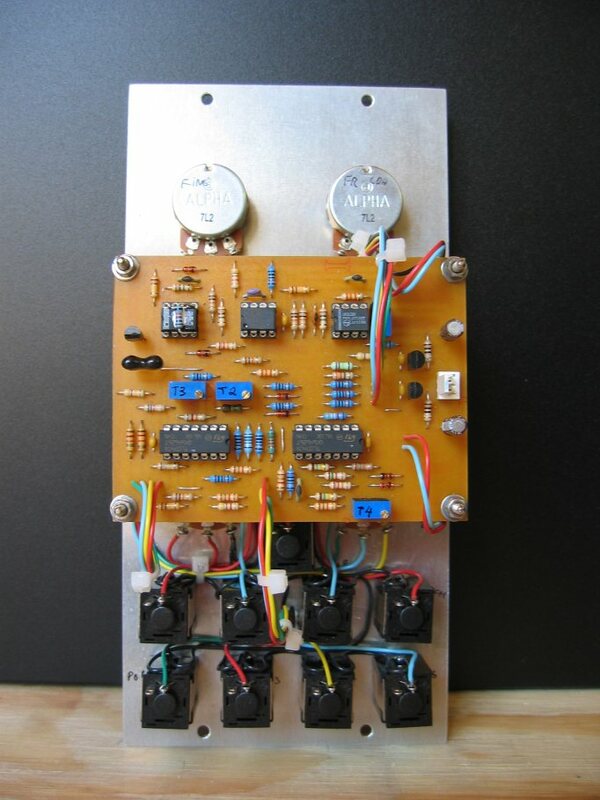 This is not a design error but was done on purpose : they are here to isolate the power supply circuit of the VCO core from the general power supply while providing a reference voltage of +/-14.2V. 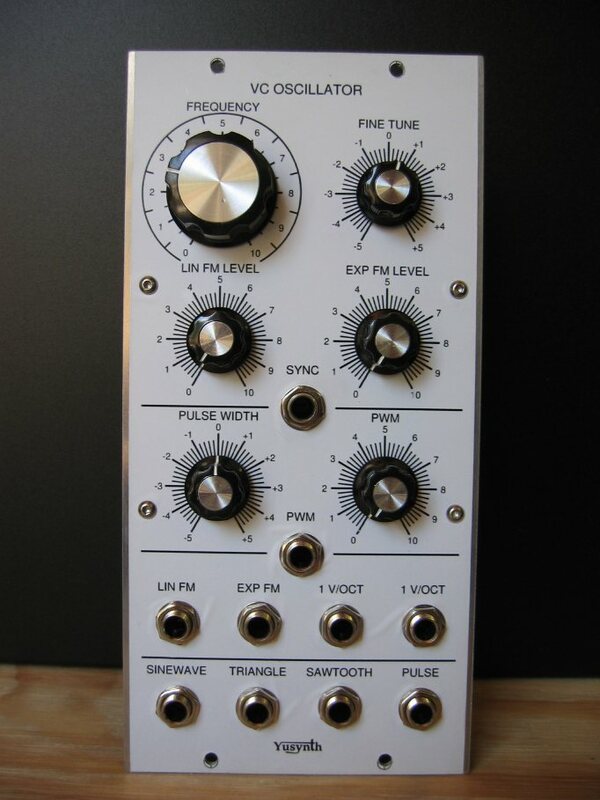 This helps very much in increasing the stability of the VCO. As such, all the circuit of the VCO core was designed considering the voltage drop through the regulators, and it is a very important point. 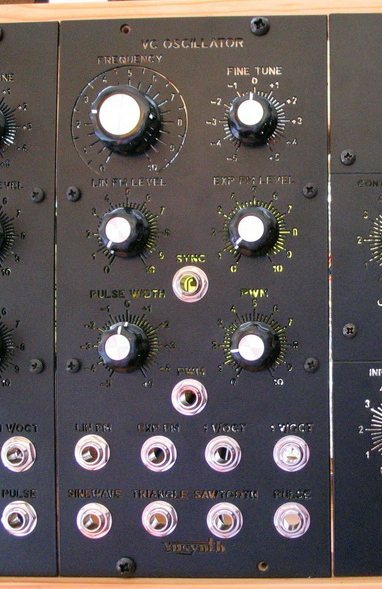 As such, if one would like to remove/bypass these regulators, one would need to recalculate many resistor values of the VCO core to have it working as expected. WARNING ! The document is formatted to be printed directly on a mylar for photo-etching or a "press & peel" paper. 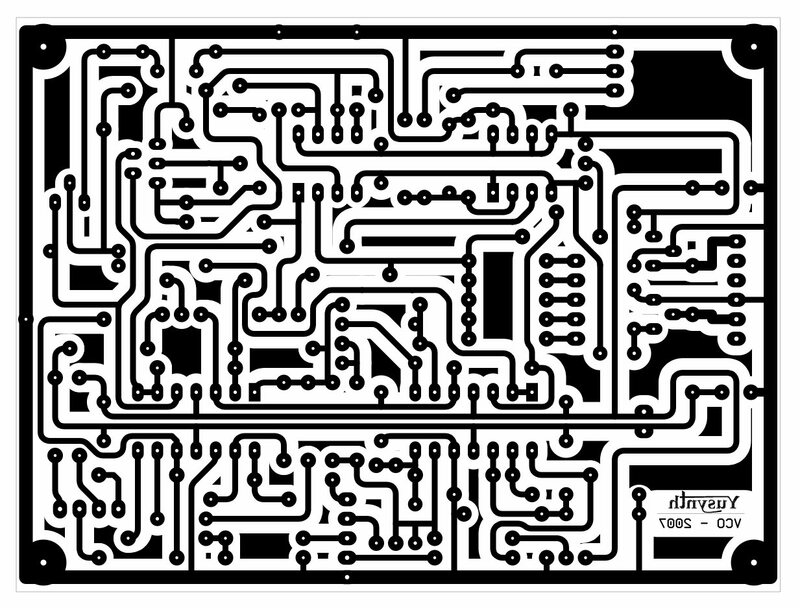 Make sure that when the printed face of mylar is in contact with the copper side of the PCB, the lettering can be read normally. If you choose to use a SSM2210 instead of a LM394, the value of R15 (10K) must be increased to 100K. 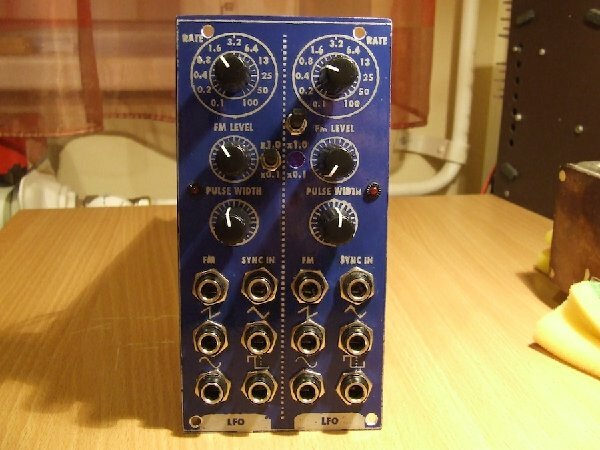 AS394 : Famous LM394 matched transistors analogue made in Latvia. NB! 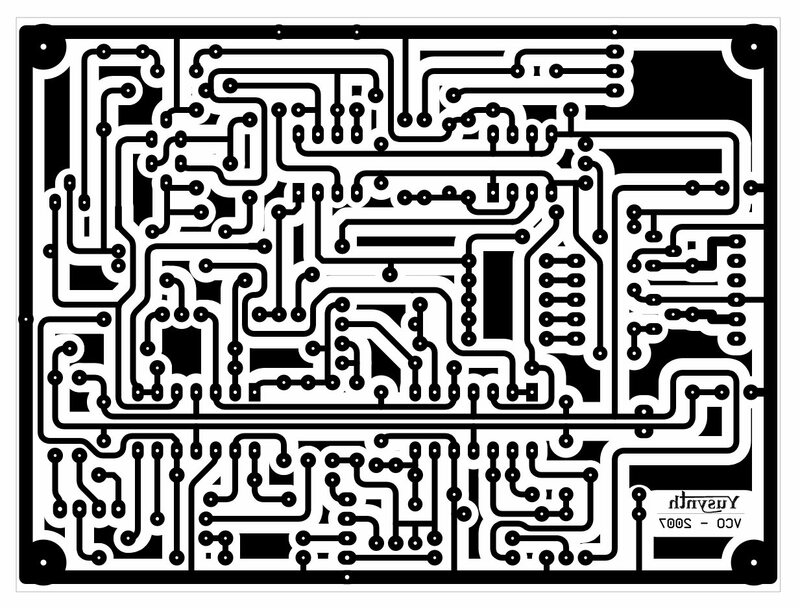 transistor configuration is the same, but pins are shifted up but futhermore there are ambiguous red spot on the IC. 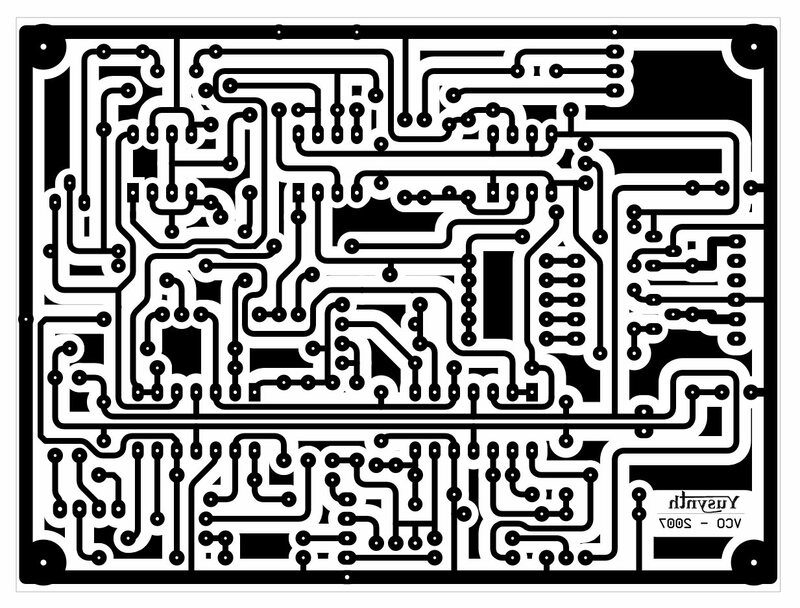 When using these on the YuSynth VCO PCB which is designed for standard LM394 pinout, you need to cut pins 1 and 8 off, and shift the IC up in the socket- pinout below explains it all - well we thought it did but Bob B asked for clarification as to which is pin 1 as it is confusing with those red blobs. We agree so armed with a meter on the diode range revealed that the small red dot is next to pin 5. The notch in the case is at the top of the chip. 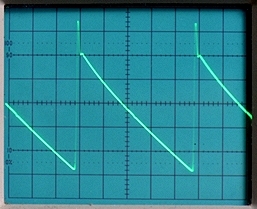 Thermal coupling between the tempco resistor and the transistor pair of the exponential converter is an important condition for insuring a good stability of the VCO. 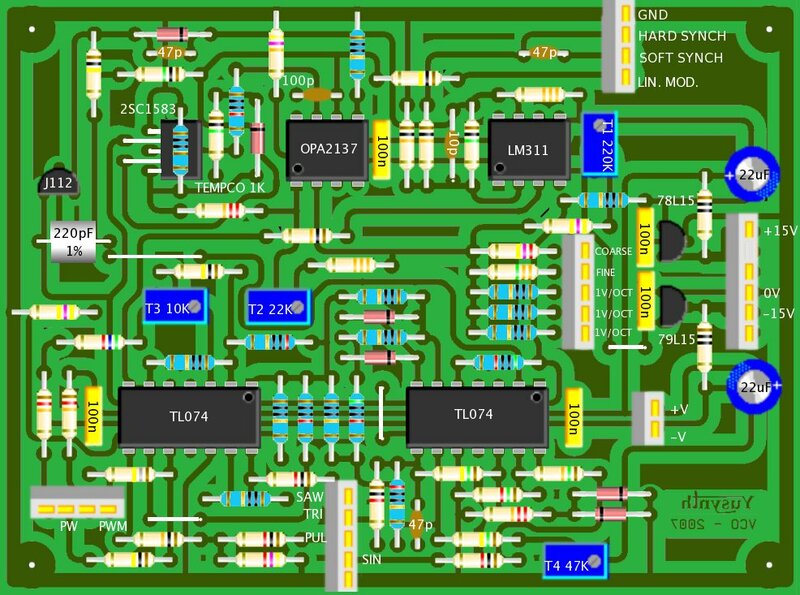 The following pictures show how to install these critical components on the PCB. 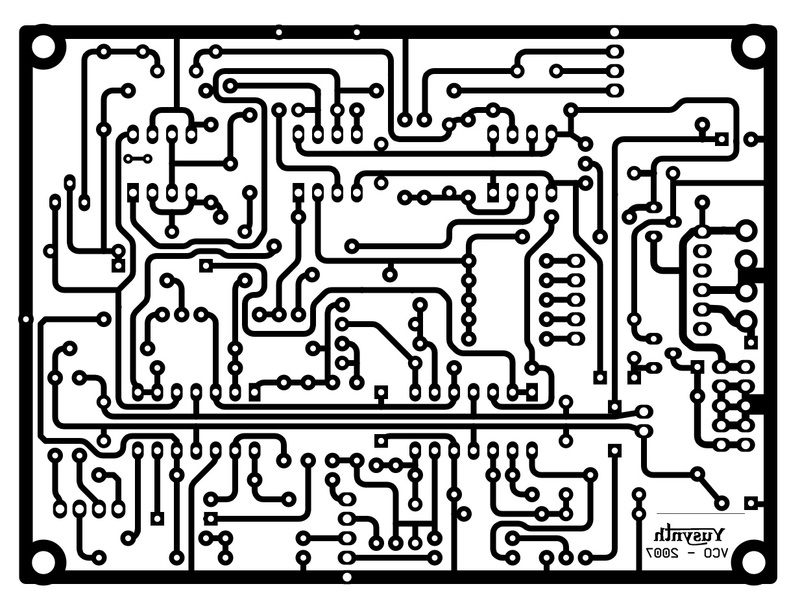 The tempco resistor R12 is not installed on the PCB. 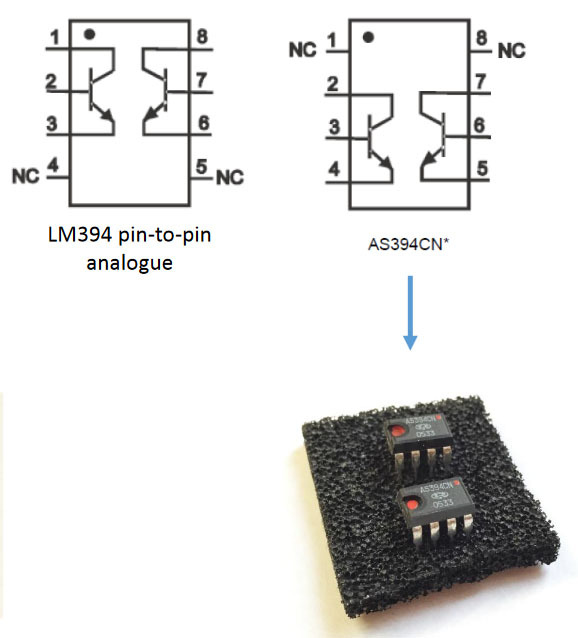 It is directly soldered to pins 4 and 5 of the LM394. These pins are connected internally and then can be used to connect R12. 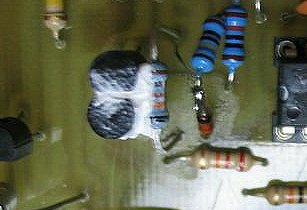 The tempco resistor is directly glued on top of the LM394. Thermal grease must be used to improve thermal coupling. Bend the 2SC1583 legs as shown. Install and solder the 2SC1583 first. Then add some thermal grease on the 2SC1583. Then install and solder the tempco resistor in bridge over the 2SC1583 such that there is a close contact between the body of the resistor and the 2SC1583. Glue the transistors together by their flat side. Solder them to the PCB. 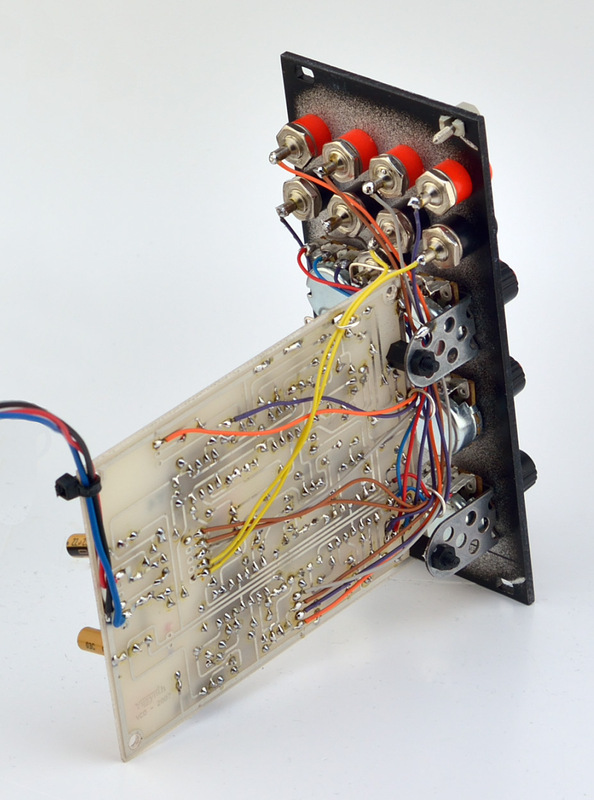 Bend the legs of the tempco R12 such that the body of R12 can touch the transistors. Apply thermal grease on the body of the transistors and solder R12. Press the body of R12 to make a tight contact with the transistors. Mariano from Dallas, Texas has moded the VCO in order to use an easy to source NTC resistor as a replacement for the PTC tempco resistor. This mod is described as well as other mods in a PDF file located at the end of this page in the Gallery section. Thanks Mariano ! 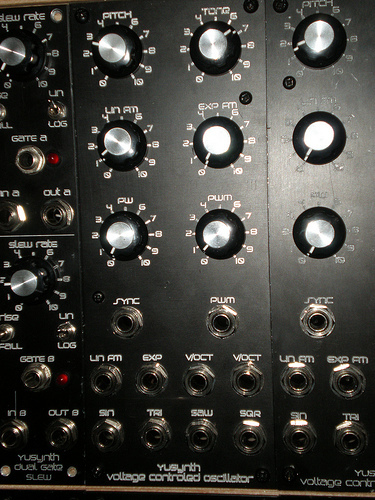 Wiring option : the SYNC IN jack may be either connected to the HARD SYNCH or the SOFT SYNCH connector depending on your taste. 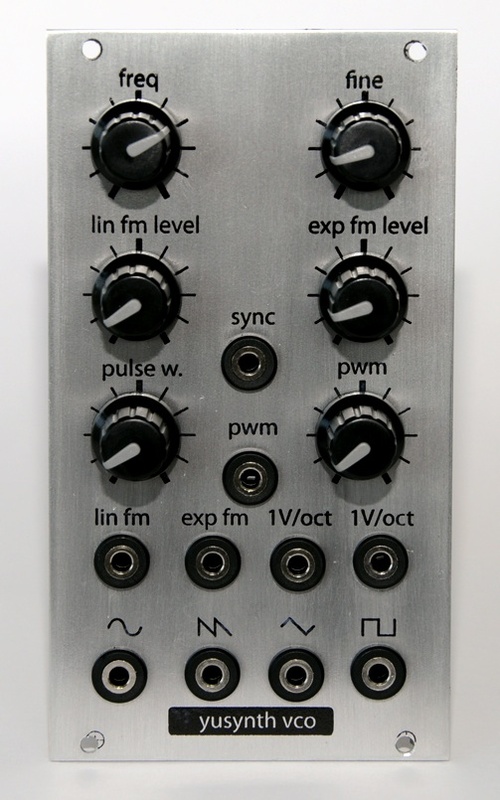 You may even add a switch on the front panel in order to select between the two hard synch modes. 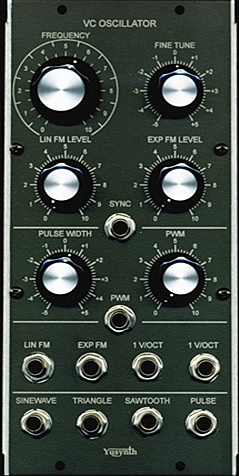 For setting and trimming of the VCO, you need a good Oscilloscope, a good source of control voltage (calibrated CV/GATE 5 octave keyboard) a good voltmeter (at least 4000 pts), a digital tuner (I am using a Korg CA tuner) and/or a good frequency counter. 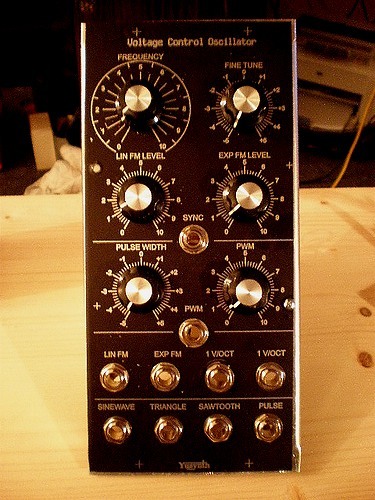 Before powering up, set all the trimmers to their mid-range position, set the FREQUENCY pot to 5 (mid-range position), set the FINE TUNE pot to 0 (mid-range position), set the LIN FM LEVEL, EXP FM LEVEL, PWM potentiometers to min (counter clockwise position), and the PW potentiometer at 0 (mid-range position). 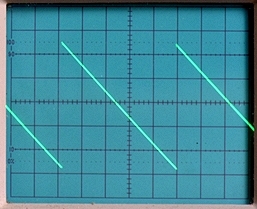 Connect the SAWTOOTH output to the oscilloscope (2V per square). Power-up the circuit. You should observe a sawtooth signal. Adjust the T3 trimmer in order to balance the sawtooth around the 0V level. The sawtooth should ramp down from +5V to -5V. 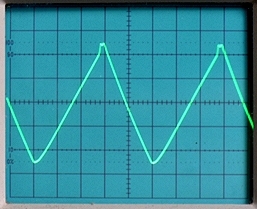 Connect the TRIANGLE output to the oscilloscope (2V per square). Adjust the T3 trimmer to refine the triangle shape. Then adjust the T4 trimmer in order to balance the triangle around the 0V level. 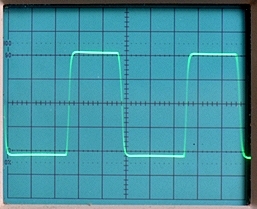 The triangle should ramp down from +5V to -5V. 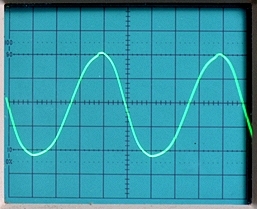 Connect the SINEWAVE output to the oscilloscope (2V per square). Adjust the T4 trimmer to refine the sinewave shape. 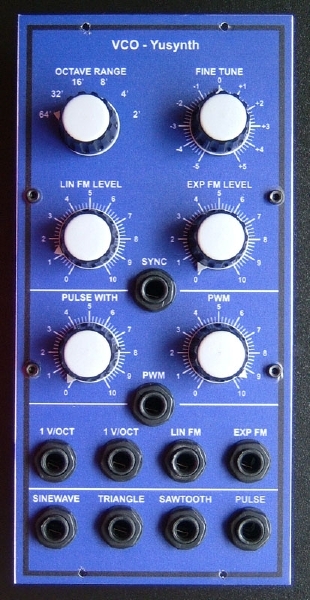 Then adjust the T4 trimmer in order to balance the sinewave around the 0V level. The triangle should ramp down from +4V to -4V. If necessary refine the setting of T3 . 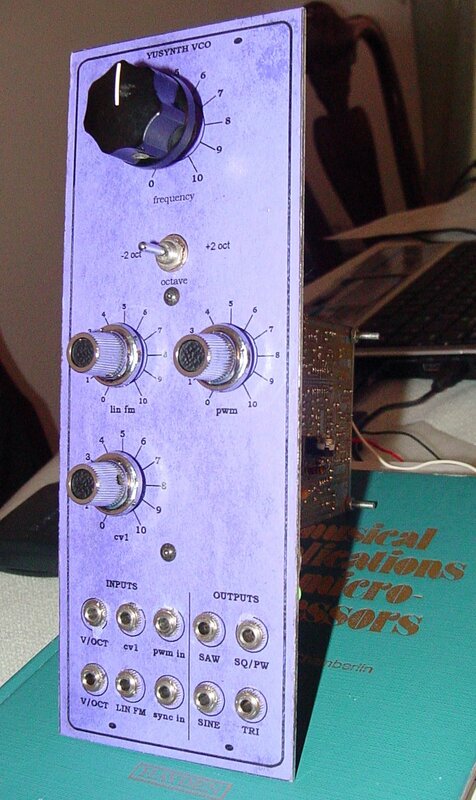 Set the CV to 1V, check the pitch/freq, ideally we want it to be A2 or 110Hz. If the pitch is what we expected go to point 4. 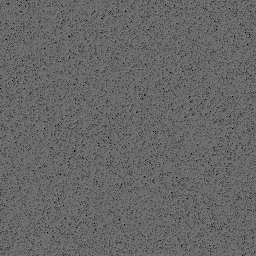 Otherwise, if the pitch is lower than expected : adjust the T2 trimmer (V/OCT) in order to lower the pitch/frequency (NOTE this may not seem logical to lower the picth when it's already too low but that's the way it works !). Conversely if the pitch was higher than expected, adjust the T2 trimmer in order to increase the picth/frequency. 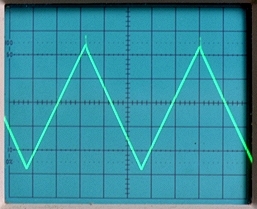 Set the CV to 0V, the picth is either lower or higher than A1/55Hz . 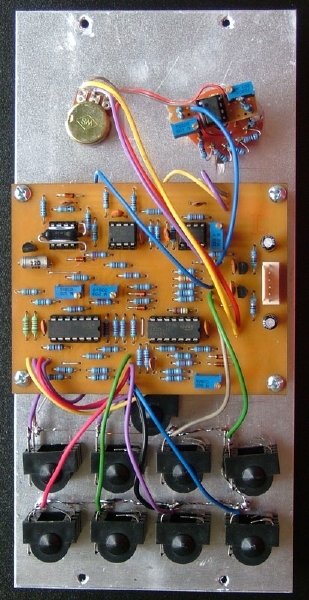 Adjust the FREQUENCY potentiometer such that the tuner displays A1/55 Hz. Repeat points 2 and 3 until there is a perfect one octave shift when switching the CV from 0V to 1V. Apply the same procedure as above for the next voltages/octaves up to A6(1760Hz)/A7(3520Hz). Depending on your component tolerance you may expect also to achieve a good tracking up to A8 (7040Hz). Disconnect the CV source from the V/OCT input. Press A3 key, and check that the pitch is A3 / 220Hz. If not adjust T1. 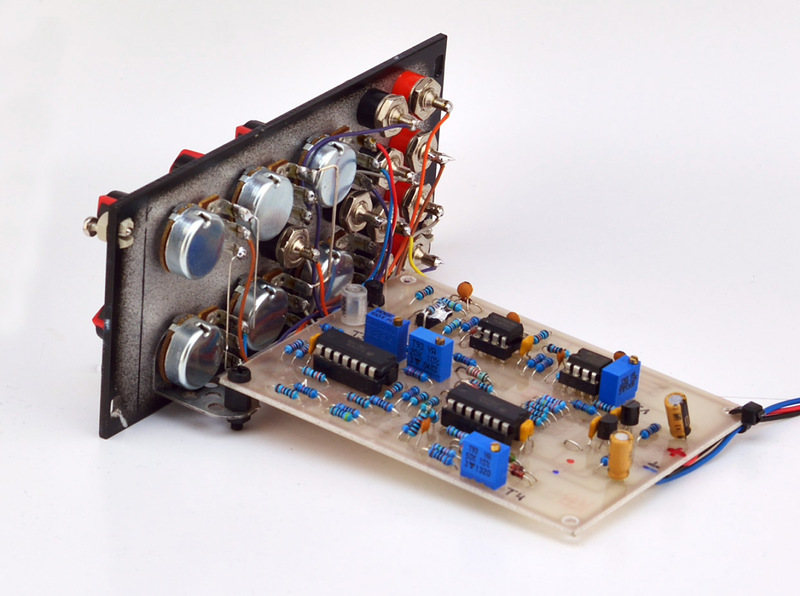 Here are the photographs of the yusynth MiniMoog VCF modules built by other synth geeks around the world. Thank you guys for sending me these nice photos. In this PDF file Mariano gives some hints on how to add a range switch and moding the VCO in order to use regular NTC instead of the PTC tempco resistor.